Welcome to the very first Virtual Potluck! Pull up a chair, grab a virtual plate, and cruise the buffet to see what interesting offerings are on the table. Our bloggers have cooked up a meal you won't easily forget. For information on the Virtual Potluck bloggers, check out the tab at the top. To see what we're tweeting about, follow #virtualpotluck. For this potluck, each blogger will be bringing a dish from cookbooks generously provided by Abrams Books. Even better, each blogger has a copy of that same book to give away. So as you sample the tasty items our bloggers have cooked for you, keep in mind that you, too, could be cooking from one - or more - of these books. Come on and meet my friends and see what goodies they brought to share with you. Visit all of their sites, say hello, admire the lovely tableware, and maybe you can take a book home with you before the party is over! Heather Scholten from Farmgirl Gourmet made a dish from the book Home Made by Yvette van Boven. While this book has recipes for preserving and other old-fashioned delights, it's not ALL about cooking like your ancestors. Heather said, "There are more than 200 unique recipes and ideas for homemade dishes including homemade cheese, ketchup and tips on smoking your own meats - including a recipe for smoked beets. This book is a great addition to any food lovers cookbook collection." The tagline on Farmgirl Gourmet is "Homegrown, Local, Sustainable, Delicious," so I can see why she chose this book. And the blog name isn't just something cute - Heather lives on a 20-acre farm. 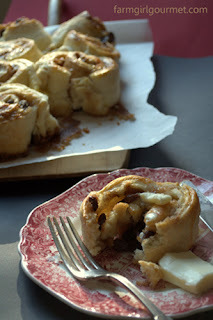 She decided to make us drool over some Sticky Cinnamon Scrolls (yes, scrolls, not rolls) filled with cinnamon and stuffed with raisins. That pat of butter on the side might be overkill, but if you're going there, you might as well go all the way there. Seriously, though, what's better than sweet cinnamon-laden bread, warm from the oven? Oh, but she's just the first one to show up at the potluck, bearing fragrant foods. There's plenty more to munch on before we're done. Theresa Greco from Foodhunter's Guide chose the book Dolci: Italy's Sweets by Francine Segan, which fits her personality so well because she's such a sweetheart. And, you know, she hunts food, probably somewhere in this galaxy. In this case, she hunted cake. Or maybe hazelnuts. 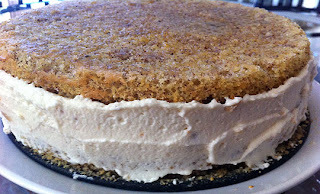 Theresa's potluck contribution was a Hazelnut Pear Ricotta Cake, which sounds unusual and absolutely divine. It's the kind of thing that you put on the table and people say, "How did you ever think of pairing hazelnuts with pears?" and they proclaim you a genius. According to the cookbook, this recipe is one of the most frequently ordered desserts in Naples and the Amalfi coast. It might be common there, but it would be a show-stopper here, don't you think? This cake has fluffy ricotta and pear custard between the layers of hazelnut sponge cake. Are you hungry yet? I know I am. I hope Theresa brought an extra cake or two to the potluck, because this cake is supposed to freeze well. I can imagine making this one ahead of time for a party. 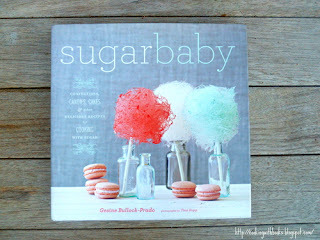 Marnely (Nelly) Rodriguez from Cooking with Books chose Sugar Baby by Gestine Bullock-Prado. Doesn't that cover photo look enticing? Nelly is the nomad of our group - we never know exactly where we'll find her, but somehow she always manages to end up in a kitchen where she can whip up some tasty delights. When Nelly brought her dish to the virtual potluck table, she said, "Nothing says 'fall' like apples, but it's ever more fall-inspired with they turn into caramel apples!" I have to say that I agree. Nelly said that since Sugar Baby is indexed by sugar temperatures, "it's a confectioner's dream come true." These apples she brought to the potluck, called Shanghai Caramel Apples, are first deep fried in a crispy but tender batter and then dipped in caramel. What makes them special? Before eating the slices, you dunk the caramel apples into ice water to get the caramel to set into hard caramel, providing an extra texture and a fun experience. Who said you couldn't play with your food? Hey, as long as I don't have to dunk for apples, I'm happy. Bring on the caramel! Rachel Gurk from Not Rachael Ray chose the book Baked Explorations by Matt Lewis and Renato Poliafito. The tagline on this book is "Classic American Desserts Reinvented," and it doesn't disappoint. 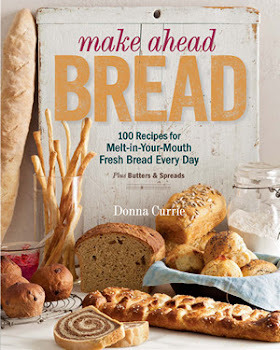 The first book from these authors, Baked, was a smashing success and in the interim, the partners opened a second bakery which is even more popular than their first. I love the idea that bakery owners are willing to share their recipes for those of us who are too far away to sample the goods in person. Speaking of Rachel, I can verify that she is indeed not Rachael Ray. And her daughter is adorable. While our Rachel might possibly say "sammies" in private to her daughter, I've never heard her say that word to an adult. Then again, she probably doesn't even say "sammies" to her daughter. For her potluck dish, Rachel made pumpkin cheddar muffins - perfect for the upcoming holidays. 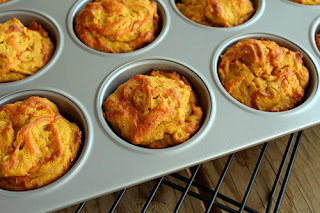 Rachel said, "They have the perfect balance of sweet and savory with a touch of cayenne to keep things interesting." The photo looks good, doesn't it? I think I'll put one muffin in my pocket for later. I don't think anyone will notice. Milisa Armstrong who is our Miss in the Kitchen chose the book Delicious Memories: Recipes and Stories from the Chef Boyardee Family by Anna Boiardi. If all you know about Chef Boyardee is from reading labels on packaged products, this book will open your eyes. First of all, it's really spelled "Boiardi" but no one could pronounce it, so he put a phonetic spelling on his products. The original Chef Boiardi was indeed a chef. Customers asked him for food to go, so they could serve it later at home. And that's how it all started. Meanwhile, the family was still cooking and eating classic Italian foods, and that's what this book is about. 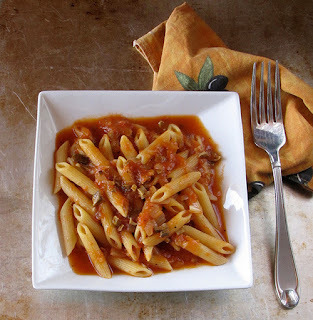 Milisa brought us this wonderful bowl of pasta - penne with mushroom sauce. Keep yer paws off that bowl, that's all mine - you can go get your own! I swear, I can smell that yummy sauce from here, just looking at the photo. See, there's more to the Boiardi family than the Chef Boyardee we're so familiar with. The fun fact about Milisa is that she lives on a ranch and we've come to understand that when she's working calves it has nothing to do with yoga and everything to do with cattle. Shelby Kinnaird, who blogs at Diabetic Foodie chose the book How to Cook Indian by Sanjeev Kapoor. Shelby brought us laziz tikka masala. Thank goodness! I was worried that we might be eating all carbs at this party, but since Shelby tends to blog about healthier foods, I knew I could count on her! 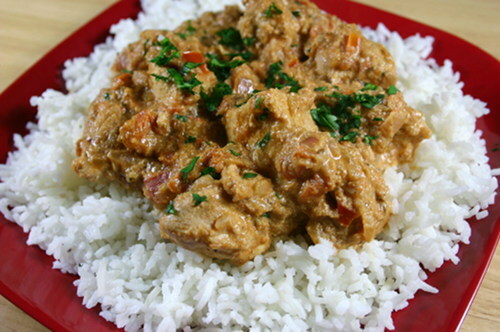 Shelby said, "This is boneless tandoori-style chicken in a spicy sauce. 'Laziz' is the Urdu word for 'luscious.'" It looks glorious with that ring of white rice, doesn't it? With garlic, ginger, garam masala, cumin seeds, coriander, you know this one is packed with flavor. The book is comprehensive - it's a big, heavy tome with more recipes than I could make in a year. Which means that if you're craving Indian food, there's a real good chance you'll find something delicious in this book. It's got everything from vegetable dishes to meat dishes to breads ... and everything in between. Don't let the ingredient lists on the recipes intimidate you. Yes, there are a lot of spices, but they are well-balanced. Like me, with two plates of food from this potluck and one more dish to sample. 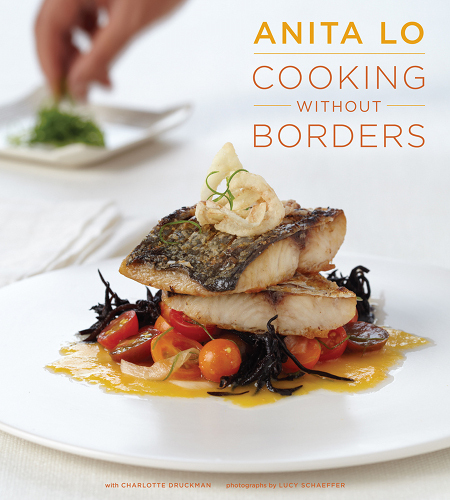 Susan Benton from 30AEATS decided that she wanted to use Cooking without Borders by Anita Lo for her potluck recipe. Susan lives on the Gulf coast, and we worry about her every time a storm rages through. But she's feisty. I have a feeling she'd be able to beat back a hurricane with a frying pan if she was in the midst of cooking something and didn't want to stop. If Anito Lo's name sounds familiar, but you don't know why, it might be from Iron Chef America where she beat Mario Batali, or it might be from Top Chef Masters, where she came in fourth place and earned $20,000 for her charity. Anita Lo's recipes in this book are all about fusion, but not in in the way that some chefs shove things together haphazardly. Her recipes are seamless. And the stories that preface each recipe make you want to cook them. I have no idea how Susan narrowed down her selection, but she brought us dry-aged ribeye with raclette-stuffed rosti potatoes. Not only is the title a mouthful, but it sounds mouth-watering, too. And nice of her to bring steaks for all of us! So that it - the preview of the very first Virtual Potluck. We hope you enjoy yourself as you browse the blogs. Grab an extra plate if you like, and bring a little something home to the kids. And make sure you visit all the blogs, sample the dishes, make some comments on all the other blogs, and win some books on those blogs! And, if you like, leave me a comment. All this virtual eating has left me hungrier than when I started, so I need some conversation to distract me. Comments here are just for fun - you need to comment on the other blogs to be able to win. I've had dinner but all of these posts look and sound so scrumptious! Thanks Donna for all of your hard work, and 30AEATS is looking forward to our #virtualpotluck this week! Everything sounds so delicious! I really love the tone of this post. It's not easy writing about something you didn't make, but you've done a pretty good job "selling" each one. 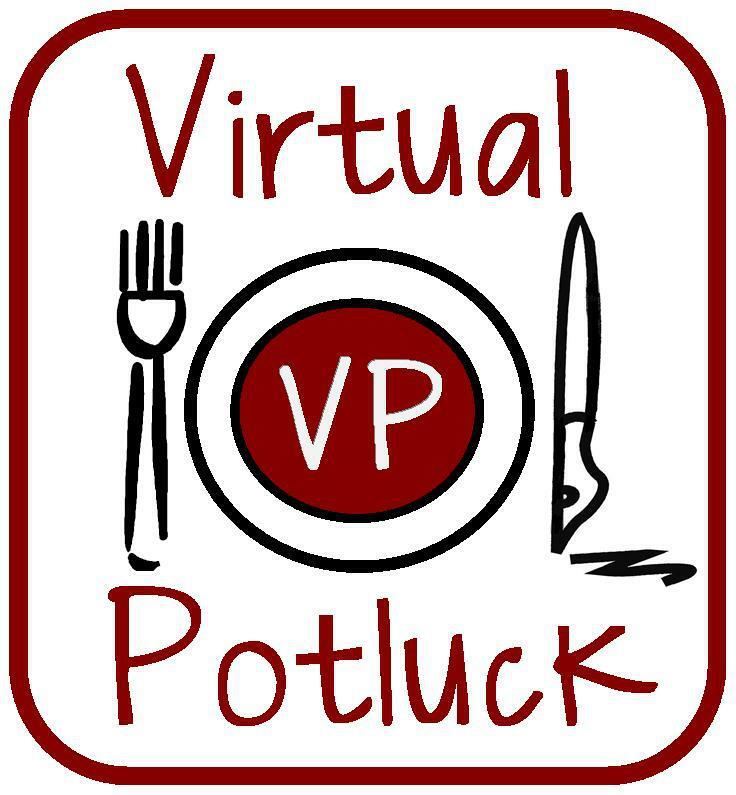 Such a fun idea, this virtual potluck! You forgot to tell us which book and recipe you chose :) can't wait to hear about it! What a fabulous round-up, so fun to read! Great job Donna, thanks! wonderful post! can't wait for the week! Can hardly wait to try the Sticky Cinnamon Scrolls and Monkey Bubble Muffins. Goodbye Weight Watchers!! Hi there, So many choices . . . YUM! 1.) I am following you on Twitter. 3.) I subscribed to your RSS AND email list. 4.) Tweeted "Enter to win . . .". 7.) Visited Virtual Potluck bloggers Theresa Greco from Foodhunter's Guide and am following on Twitter and email, and Milisa Armstrong (Miss in the Kitchen) and am following on Twitter and RSS. I just stopped by after reading Farmgirl Gourmet! I love your recipes....and will become a regular follower! Thanks. Thanks for making us sound so good, Donna! Happy Virtual Potluck Debut Day! What a cool group you have formed! I'm very excited to have found you. Yuri, I'm not cooking anything for this potluck - I brought plates, knives, and forks :-) Tough job, but someone's got to do it. So many of my 'tweeps' are included in your potluck - it's been fun to see all of the different posts and recipes. The 30AEATS giveaway looks great. Great post, Donna. I love how you rounded up everyone's posts. 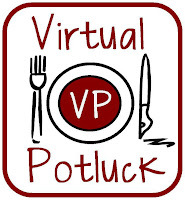 I am very honored to be a part of the Virtual Potluck gang! The roundup looks fantastic and so happy to be a part of this food party! What a fun potluck, and I love all your blogger guests! Can't wait to go check out all the yummy recipes and cookbooks! So many great cookbook giveaways... I want to enter them all! I love being able to see new to me bloggers info also. Food Hunters Guide sent me! I wish I had seen this earlier, some of the giveaways are closing now and these are amazing cookbooks! What an amazing spread! Wish this was a real dinner I could sign up for. If it was, pls put my name right there! Seriously, love this concept! Great recipes and great food!